Tonight, I directed dinner the way one might direct a play if the actors (well in this case actor) had never looked at the script. 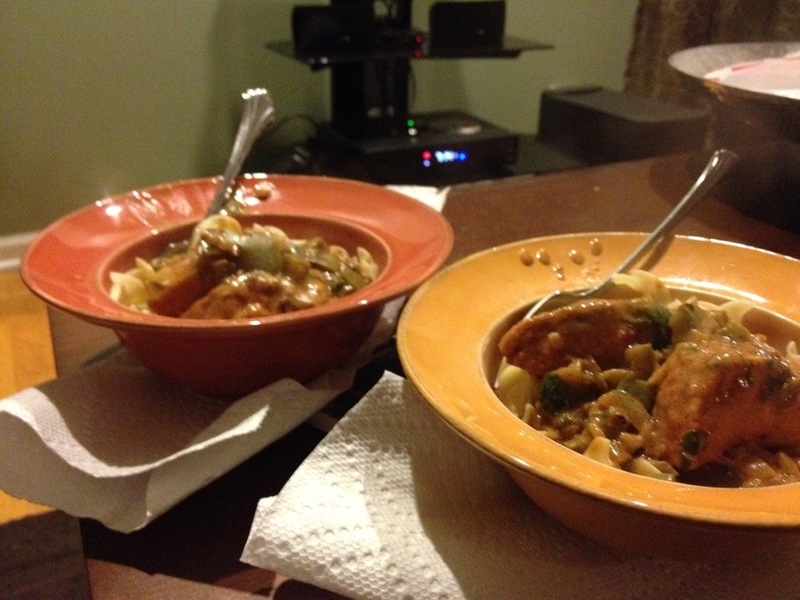 From my place on the couch, I looked at a recipe for chicken paprikash and told my husband what to do in the kitchen. It was a cooking challenge the likes if which you might see on Top Chef. Now I do not always enjoy cooking. I’m more of a baker, but as something to do as a couple, I like it. Usually, I would participate more actively, measuring, stirring, but still probably giving directions. This time I had to do it from the couch, because I had my knee injected today, so we made a fun game out of it. I couldn’t see what he was doing and he could only rely on my interpretation of the recipe and guidance. It was a test of our communication skills with delicious results. Having my knee injected was only part of today’s appointment. My doctor does not think these current medications are working so we are moving on to bigger, stronger things. Now I have not done my research yet (that’s for later tonight) but it looks like I will be taking Actemra, an infusion. I will go in to the office once a month for about two hours to get the medication via IV. Just from talking with my doctor, it seems the risks and side effects are the same as other drugs in this class that I have taken, Enbrel and Humira. But he still encouraged me to read “the whole scary list” so we could talk about it. He knows that I have a tendency towards anxiety when it comes to these potential side effects, so I will want to make sure we are monitoring them closely. New medications in particular put me on edge because I don’t know how my body will respond and I worry about the worst possible outcome. It’s like seeing a drug commercial on tv and wondering why on earth anyone would take it with the list of potential side effects they rattle off at the end. But as my doctor likes to point out to me, the risks are rare and usually manageable while the benefits could be exponential for me. And this disease has its own risks, just as scary (things like heart attack, stroke, and cancer) when left uncontrolled. So I’m learning to live in the moment and not worry about potential future side effects of medication or disease. I’ll still be cautious, do my research and keep my eye out for strange symptoms, but I’ll try not to let stress keep me from life and my fun activities. I’m on my 2nd infused drug- Rituxan- it’s working great, I haven’t had any exotic side effects, here’s hoping your treatment goes well. Also, It looks like the drug you are considering is made by Genentech, the same co. as Rituxan. They will help with out of pocket expenses, not sure if your doc mentioned it.